Charlie Hebdo (French pronunciation: ​[ʃaʁli ɛbdo]; French for Weekly Charlie) is a French satirical weekly newspaper, featuring cartoons, reports, and jokes. It was founded by Georges Bernier and François Cavanna in 1970. The stories and cartoons they publish are very left-wing and anarchist, with primarily political satire. Following a long tradition in France, called anti-clericalism, the magazine strongly criticized all religions; it has often published caricatures of Jews, Muslims or Christians (especially Catholics). Some Islamic fundamentalists were offended at some cartoons, and repeatedly sent death threats to the journalists of Charlie Hebdo. On 7 January 2015, there was a massacre at their office, in which six journalists and cartoonists were killed. This massacre was a shock to millions of people in the world. It was felt to many people like an attack on the freedom of speech, which is an essential part of a democracy. 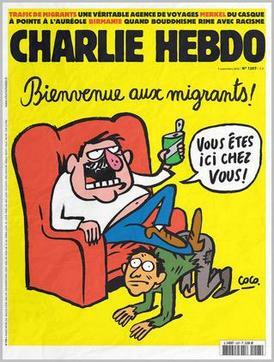 Image of 3 November 2011 cover of Charlie Hebdo, renamed Charia Hebdo ("Sharia Hebdo"). 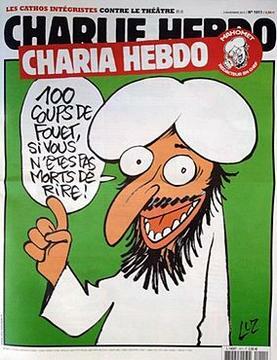 The word balloon reads "100 lashes if you don't die of laughter!" Charlie Hebdo Facts for Kids. Kiddle Encyclopedia.